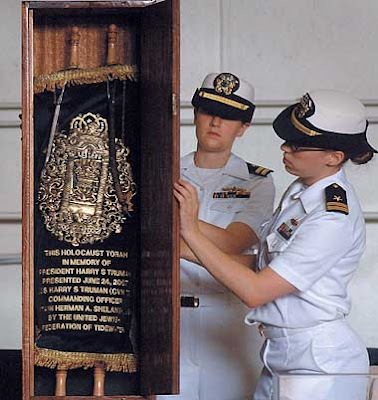 remaining Torah from Lithuania presented to the US Navy for the benefit of the Jewish Service men and women. Word Document, insert page numbers and then print it out. The Russian page is a much larger document and will be a print out of around 20 pages. These pages will take three minutes to download using a Modem and 20- 30 seconds using Broadband. NORFOLK, Va. (AP) - A Torah scroll rescued from Lithuania has a new home aboard the United States Navy aircraft carrier Harry S. Truman. of a dedication ceremony attended by a crowd of 500, including some Holocaust survivors.
. It's about all of us understanding the dignity of human life." Several Jewish service members celebrated the event, taking photos with the heavy 26-inch high scroll bearing the words of the Hebrew Bible. 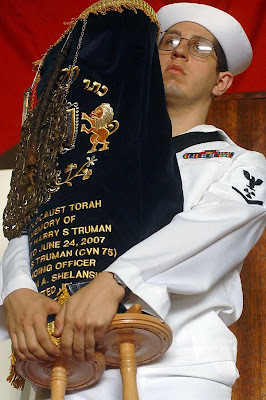 Machinist's Mate 3rd Class Jesse Kopelman, USS Harry S. Truman's (CVN 75) Jewish Lay Leader, holds a holy Jewish Torah, one of the few scrolls from Lithuania to survive the Holocaust, which was presented to Truman. About 5 percent or less of Lithuania's Jewish population survived the Holocaust. No religious artifacts, other than this Torah, are thought to remain of that country's Jewish population, organizers said. "I'm very proud of our servicemen who are serving, and I'm very proud that they saw fit to have a Torah on board the ship," said Julius Marcus of Portsmouth, who attended with his wife, Jeanne. the Harry S. Truman Presidential Library. That Torah was on loan to the carrier and displayed next to the Torah that was dedicated. Responsible News & Views from The Galilee Institute in Jerusalem, Israel. (see image) Grand Duchy of Lithuania at its Greatest Extent, Showing Cities Where Jews Lived. In criminal or other cases involving the person or property of a Jew, the latter can not be convicted on the testimony of one Christian witness; there must be two witnesses—a Christian and a Jew. Where a Christian asserts that he has placed an article in pawn with a Jew, and the Jew denies it, the latter may clear himself by taking the prescribed oath. Where a Christian claims that he has pawned an article with a Jew for a sum less than that claimed by the latter, the Jew's claim shall be allowed if he take the usual oath. Where a Jew claims he has loaned money to a Christian, but has no witnesses to prove it, the latter may clear himself by taking an oath. Jews may make loans on any personal property except blood-stained articles or articles employed in religious service. Where a Christian asserts that an article pawned to a Jew has been stolen from a Christian, the Jew, after swearing that he was ignorant of the robbery, is relieved of responsibility to the owner of the article, and need not return it until the sum advanced by him, with the Interest, has been repaid. Where a Jew loses pawned property by fire or robbery he is relieved from responsibility for articles so lost if he takes an oath that such articles were lost together with his own. A suit between Jews may not be decided by a city judge, but must be submitted in the first instance to the jurisdiction of the subwaywode, in the second instance to the waywode, and finally to the king. Important criminal cases are subject to the jurisdiction of the king alone. A Christian found guilty of inflicting wounds upon a Jewess must pay a fine to the king and damages and expenses to the victim, in accordance with the local regulations. A Christian murdering a Jew shall be punished by the proper court and his possessions confiscated to the king. A Christian inflicting injuries upon a Jew, but without shedding blood, shall be punished in accordance with local law. A Jew may travel without hindrance within the limits ofthe country, and when he carries merchandise he shall pay the same duties as the local burghers. Jews may transport the bodies of their dead free of taxation. A Christian injuring a Jewish cemetery shall be punished in accordance with the local law and his property confiscated. Any person throwing stones into the synagogue shall pay to the waywode a fine of two pounds. A Jew failing to pay to the judge the fine called "wandil" shall pay the anciently established fine. Any Jew not appearing in court after being twice summoned shall pay the customary fine. A Jew inflicting wounds on another Jew shall be fined in accordance with local custom. A Jew may take an oath on the Old Testament in important cases only, as where the claim exceeds in value fifty "griven" of pure silver, or where the case is brought before the king. Where a Christian is suspected of killing a Jew, though there were no witnesses, and the relatives of the victim declare their suspicion, the king is to give the Jews an executioner for the accused. Where a Christian assaults a Jewess he shall be punished according to local usage. A subwaywode may not summon Jews to his court except on a regular complaint. In cases concerning Jews the court is to sit either in the synagogue or in a place selected by the Jews. Where a Christian pays the sum advanced to him on any article when due, but omits to pay the interest, he shall be given a written extension of time, after which the sum unpaid shall be subject to interest until paid. The houses of Jews are free from military quartering. When a Jew advances to a noble a sum of money on an estate, the Jew is entitled, if the loan be not repaid on maturity, to the possession of the property, and shall be protected in its possession. A person guilty of stealing a Jewish child shall be punished as a thief. If the value of an article pawned with a Jew by a Christian for a period less than a year does not exceed the amount advanced upon it, the pawnbroker, after taking the article to his waywode, may sell it; but if the article is of greater value than the sum advanced the Jew shall be obliged to keep it for a further period of one year and one day, at the expiration of which time he shall become its possessor. No person may demand the return of pawned property on Jewish holy days. Any Christian forcibly taking an article pawned with a Jew, or entering a Jewish house against the wish of its owner, shall be subject to the same punishment as a person stealing from the common treasury. To summon a Jew to appear in court is allowed only to the king or the waywode. Since the papal bulls show that Jews are forbidden by their own law to use human blood, or any blood whatever, it is forbidden to accuse Jews of using human blood. But in the case of a Jew accused of the murder of a Christian child, such accusation must be proved by three Christians and three Jews. If the Christian accuser is unable to prove his accusation he shall be subjected to the same punishment that would have been inflicted on the accused had his guilt been proved. Loans made by Jews to Christians must be repaid with interest. The pledging of horses as security on loans made by Jews must be done in the daytime; in case a Christian should recognize a horse stolen from him among horses pawned with a Jew, the latter must take an oath that the horse was received by him in the daytime. 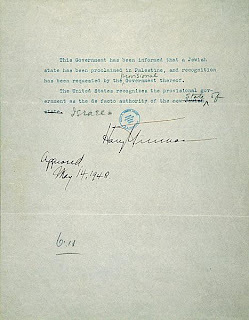 Mint directors are forbidden to arrest Jews, when the latter are found with counterfeit coin, without the knowledge of the king's waywode, or in the absence of prominent citizens. A Christian neighbor who shall fall to respond at night when a Jew calls for help shall pay a fine of thirty "zloty." Jews are permitted to buy and sell on the same footing as Christians, and any one interfering with them shall be fined by the waywode. Historians are agreed that Casimir was not a strong and just ruler. He did not scruple to give contradictory promises to Poland and Lithuania, and his frequent favors to the Jews do not necessarily show that he was their friend. At most he considered them as useful agents in his financial undertakings.The influential Jewish tax-farmers often encountered difficulties with foreign merchants. The Russian Grand Duke Ivan Vassilivich III. repeatedly made representations to Casimir in regard to the high-handed treatment of Muscovite merchants and ambassadors by the tax-collectors Shan (the son-in-law of Agron), Simha, Ryabchik, and others. The king upheld his Jewish tax-farmers on the ground that the Russian merchants attempted to evade payment of customs duties by choosing rarely traveled roads. From these documents it is also clear that the Jewish customs officials had under them armed men to arrest violators of the regulations. At Casimir's death (1492) many of his Jewish creditors were left unpaid. Sbornik Budushchnosti, i. 244.H. R.